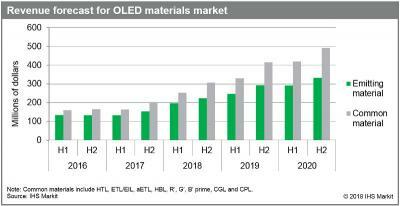 IHS Markit says that OLED materials (emitters + stack materials) revenues reached $355 million in the second half of 2017, up 20% from the first half of the year. This followed a year and a half of stagnation in revenues (sale volume increased, but this was offset by price reductions). IHS expects the OLED materials market to continue growing in the near future, and revenues in the 2020 will reach about $1.5 billion. The growth will be driven by further Apple OLED adoption and increased OLED TV production. Last month DSCC released their own OLED material market estimates, which are higher for 2017. According to DSCC, total material revenues in 2017 reached $869 (growing 43% from 2016), and are expected to reach $2.56 billion by 2022. The future forecast, however, is a bit outdated as DSCC has since revised their OLED forecasts down.